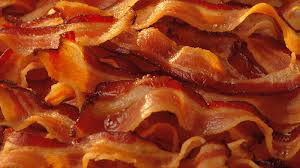 Over two billion pounds of bacon is made in the U.S.A each year. Bacon is healthier than hot dogs, hamburgers and glazed donuts in terms of salt, calories, fat and cholesterol. A 200-pound pig will produce approximately 20 lbs. of bacon. 70% of all bacon in the U.S. is eaten at breakfast. Bacon contains vitamin B1, B12, and Zinc. Bacon Day is held on the Saturday before Labor Day. A man named Chuck once proposed to his girlfriend with bacon. He cooked four pieces of bacon in the shape of a heart and then placed the ring in a box in the center of the bacon heart. In the U.S., bacon often comes from pork belly. In other countries, bacon comes from back or side cuts. Bacon is treated for trichinella, a parasitic roundworm, which is destroyed by cooking, smoking, freezing, or drying. Bacon is used in lots of alcoholic beverages, such as bacon vodka. Beef, turkey, chicken, lamb and even goat may be used to make bacon. In a 2009 British survey conducted by onepoll.com, men preferred the smell of bacon and petrol to the smell of a newborn baby. The word "bacon" comes from the German word bacho, which means buttock. A T-shirt saying said: I'd be a vegetarian if bacon grew on trees. Cottage bacon is lean pork that is thinly sliced from the shoulder. It is usually cut into oval or round pieces. During the Middle Ages in England, beans and bacon were a staple for the poor. During the 1500s, the Spanish gave Native Americans pigs as peace offerings, knowing the natives liked the taste of pork. Dry-curing bacon is the oldest curing method. The meat is rubbed with salt, spice, and sugar, and then is hung in a cool place for two weeks. Snake 'n' Bacon is a comic book about a snake and a piece of bacon, who are spoofs of other comedy duos. The bacon often makes funny bacon-related comments. 16-20 strips of bacon= 1 pound of bacon. 1 cup of bacon fat= 1 pound.